There is a lot of arty stuff going on in Bromsgrove; they even have a Bromsgrove Arts News magazine, published by Bromsgrove Arts Alive. This doesn’t make up for the fact that many Bromsgrove inhabitants don’t receive our wonderful Village mag but it does demonstrate that the arts are alive and kicking in their community. I met two of Bromsgrove’s art heroes when I went to visit the All Saints Art Group in Bromsgrove a while ago. My original contact with the group was Tony Turpin, whose life seems to be threaded through the fabric of the arts in Bromsgrove. He is a painter, certainly, but he also organises the All Saints art exhibition during Bromsgrove Festival, is a member of Bromsgrove Arts Alive and is on the Bromsgrove Festival organising committee. During June and July this summer, more than 300 paintings were offered for sale at this exhibition organised by Tony, with prices ranging from tens to hundreds of pounds. Many pieces were sold, raising £800 for the All Saints Church restoration fund. The second Bromsgrove Art Hero is Malcolm Brookes, tutor for the All Saints Art Group. This accomplished artist is a member of the RBSA (Royal Birmingham Society of Artists) and recently had a large exhibition of work at Artrix entitled Bromsgrove Framed, which showed paintings of Bromsgrove completed over 40 years. Malcolm is a highly versatile artist, happy working in oils, gouache and pastel as well as many other types of media. This makes him an ideal teacher – firstly in secondary schools and later teaching in adult education. 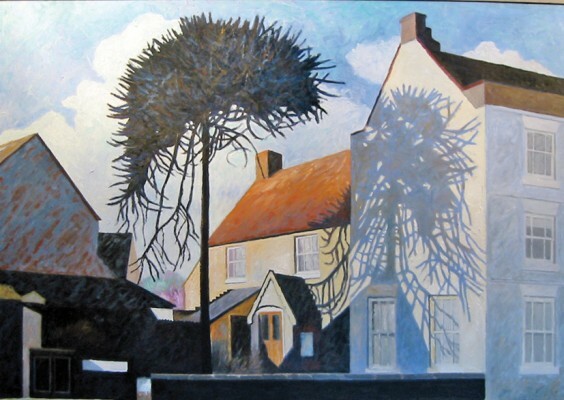 Malcolm (whose painting, Hanover Street Monkey Puzzle, is shown above) now also gives lectures at art societies and shows his work in galleries, both locally and further afield. So, to All Saints Art Club where I met these two artistic men. When I visited, 11 keen amateurs were working away on a variety projects, using a broad range of different media and all seeming to achieve excellent results. They were Kathy Mackenzie, Yvonne Webster, Margaret Rhodes, Margaret Langley, Diane Aspinal, Bob Foskett, Matt Round, Harry Wells, Ken Blears, Tim Harris and John Matthews. The group meets every Monday during term time, 7.30pm to 9.30pm in All Saints Church Hall, and many of them exhibit their work at the annual exhibition I mentioned. What always amazes me when I visit local art exhibitions, like the one held in All Saints Church this summer, is how little some artists ask for their work! When I see a £20 price tag on a well-framed piece of quality work that must have taken hours to complete, I am amazed. There are real bargains to be had and, even if the work is not to your taste, it is always interesting to see the imaginative and skilled work that individuals in our communities produce. If you want to grab yourself a real art bargain this winter, I can think of no better place than the RBSA’s StART exhibition, held this season from December 30 until February 7. This is a show where RBSA members put work up for sale, all priced at £200 or under. When I viewed this exhibition last year there was some incredibly good work, all at prices that would normally have an extra nought on the end. On a personal note, I recently sold a painting to a local Wetherspoon’s – a new and rather thrilling experience. I know from visiting the Royal Enfield Wetherspoon’s in Redditch that the chain has a policy of including items of local interest, and I assume that my leafy painting fitted in with the “Urbs in Rure” (town in the country) ethic of Solihull. I also include my latest painting (below), which I have entered for an exhibition at the RBSA’s Birmingham & Beyond exhibition, running until December 24. Hopwood locals may possibly recognise this scene: Gary’s House, Late Summer Garden? I wish you all a very happy Christmas and all the best for 2015.